Later than planned I have the second of my travel posts. A bit after we got back my laptop broke and I haven't been able to get everything off my hard drive; still not sure if it is broken yet. Sadly half of my pictures were on there. On the plus side I still had some New York and all the Washington pictures on my SD card. 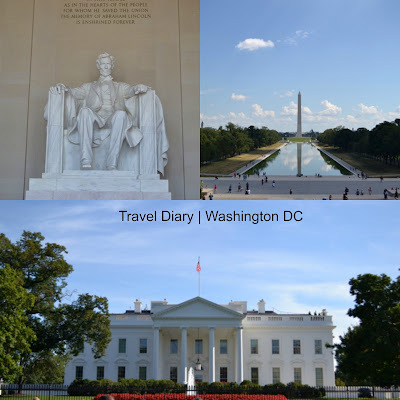 Hopefully I will be able to share the New York pictures soon but for now here's what we got up to in Washington. We arrived in the middle of the afternoon, all a bit exhausted and in need of some coffee. There was a great coffee shop opposite the hotel so we went there then didn't want to waste the day so went to see the White House. It was about 5 blocks from the hotel; about a 10 minute walk. The White House is one of those buildings i've seen in pictures a bunch of time but it was really great to see it in person. It felt a lot bigger and had a lot of security around it. There's a lot of other important buildings around here and we even saw the Segway tour go past. This was something we considered doing but it was so hot we decided to do everything on foot instead. The next day we decided to do some museums. There are so many in Washington it was hard to pick which to do. First we did the Spy Museum which was interesting; lots of things to see so worth the money. That ended up taking most of the morning so after lunch we went to the Air and Space Museum. This might have been one of my favourite parts of the trip. It was free and there were so many planes to see and you could just wonder round at your own speed. Then we grabbed an ice-cream; definitely needed on a hot day and ended back to the hotel. After freshening up we went for food, drinks and relaxed. On the next day we decided to visit most of the monuments. Luckily most of them are in the same area so you can walk from each one. We went to the furthest first to the Arlington Memorial. This is where there is the grave of John F Kennedy and the graves of soldiers. It was a breathtaking place and so much bigger than I expected. I didn't take any pictures here out of respect but I would highly recommend going if you can. Then we headed to the Lincoln Memorial which was very impressive and was definitely a busy tourist spot. We then saw the Korean War Memorial which was really unique. Each memorial is completely different which makes it even more interesting to visit them all. Then we saw the Martin Luther King Jr Memorial which was carved out a big piece of stone. This was definitely the most impressive and had parts of his speeches around the outside. We wanted to spend at least one day relaxing and shopping. We decided to go to Target which was about a 30-40 minute walk. This was actually nice to see the less touristy side of Washington. Target was amazing and we ended up spending a decent amount of time there (beauty shopping definitely happened). We then went back to the hotel, freshened up then went to Macy's and a few other shops. The last day we just relaxed, had breakfast and coffee then got ready to go home. We had to be at the airport for about 3 so didn't have too much time to do anything big, plus we were all pretty tired at this point. The weather was amazing for the whole holiday and it only started to rain on the way to the airport. Washington DC was so amazing to visit. There's so much to see and if you love history you will have an amazing time. It has a nice relaxed vibe, compared to New York and there's lots of coffee shops and places to eat. I'm now making a list of other places I want to visit in America. I think Chicago or Portland is up there. What are your favourite places to visit in America?